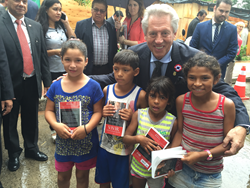 John Maxwell and hundreds of his internationally Certified Coaches visit Paraguay; deliver team leadership training through the structured Maxwell Roundtable Method. Goal to spur transformational growth in the country and reach 700,000; Maxwell will return in March 2016. I want to partner with the people of Paraguay. We are not the answer - the people of Paraguay are the answer. Asuncion PY - February 2, 2016: 10,000 Paraguayans have been trained by John C. Maxwell in a team leadership training with 250 certified international coaches, volunteers and leaders. The group has converged on Asunción, Paraguay at the invitation of President Horacio Cartes. The special team leadership training delegation has conducted a national not-for-profit leadership education project known as Transformación Paraguay, under the guidance and development of in-country leaders, Tim and Gabriella Teasdale. The team leadership training coach-facilitators are delivering the structured “Maxwell Roundtable Method” to thousands of participants in an intentional effort to bring transformational energy to Paraguay. The most common form of training used is one-way communication where one person talks and everyone else listens. However, the Maxwell Roundtable Method is a simple and highly effective exercise designed to foster two-way communication in a structured environment. In this way, ideas are not taught; they are facilitated. During a Roundtable, a designated person leads, but all participants share from their own experience. As a result, everyone grows together - including the facilitator. Through the process, the participants are taught to facilitate and duplicate the Maxwell Roundtable Method. Through duplication, the process is expected to reach 700,000 Paraguayans - 10% of the population - over the coming months. “Too many countries and organizations try to microwave leaders, but you can't "Pop tart" leaders,” Maxwell said. “The reason I am in Paraguay is because after training 5,000,000 leaders in every country I realized something: If I could help leaders go from being trained to being transformational, they could lead with a greater impact. The most common leadership challenge is attempting to go uphill while holding onto downhill habits. Paraguay will not get better because of a dream - the dream will be realized because of the action that is taken. The dream is free, the journey isn't. I want to partner with the people of Paraguay. We are not the answer - the people of Paraguay are the answer. It's not enough to hear a message. We hear messages all the time - we have to internalize that message, and act upon it. I leave on Thursday, and the success of Paraguay will be determined by those who stay here to add value to others.” Maxwell added. Over the course of five rigorous days, the specially trained delegation has met with top government, military, education, business, faith and community leaders with one goal in mind: hand over proven tools to the leaders of Paraguay in a structured process for their further leadership development through the power of the values-based Maxwell Round Table Method. Maxwell has been invited to deliver the Maxwell Roundtable Method by the leaders of 22 nations. He and a special delegation delivered the method in Guatemala - visits to more countries are in the works. After discussing specific leadership values and how to personally improve upon each, table participants are asked to proactively practice the growth method for one week, then reach out to five members of their community and teach them the same process. This process is expected to create a cultural paradigm shift from the top down - and Roundtable to Roundtable, participant to participant. One-third of the Paraguayan population lives beneath the poverty line. By equipping leaders through the Maxwell Roundtable Method with values-based content for them to teach to others, a revolution of transformational leadership can fast-track a country and help it move forward with confidence. John C. Maxwell is a #1 New York Times bestselling author, coach, and speaker who has sold more than 26 million books in fifty languages. In 2014 he was identified as the #1 leader in business by the American Management Association® and the most influential leadership expert in the world by Business Insider and Inc. magazine. As the founder of The John Maxwell Company, The John Maxwell Team, EQUIP, and the John Maxwell Leadership Foundation, he has trained more than 6 million leaders. In 2015, he reached the milestone of having trained leaders from every country of the world. The recipient of the Mother Teresa Prize for Global Peace and Leadership from the Luminary Leadership Network, Dr. Maxwell speaks each year to Fortune 500 companies, presidents of nations, and many of the world’s top business leaders. He can be found on Facebook and Twitter. For more information about John visit JohnMaxwell.com.